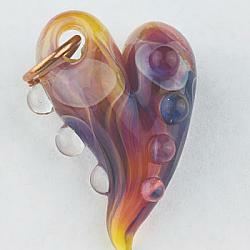 Golden Heart Pendant...spun in the flame by hand, of borosilicate glass, one of a kind glass pendant. Light and medium amber colors, crystal drops for additional sparkle. Added jump ring for stringing on a chain or silken cord. 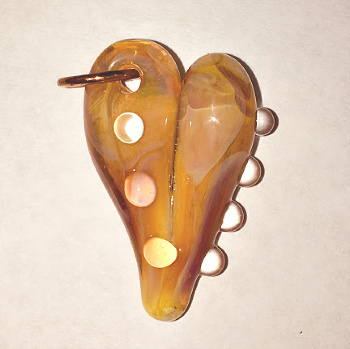 Sweet honey gold glass heart pendant, spun in the flame from borosilicate glass in pale and dark amber all swirled together for a warm glow. Sparkling drops of honey gold for that great boro sparkle. 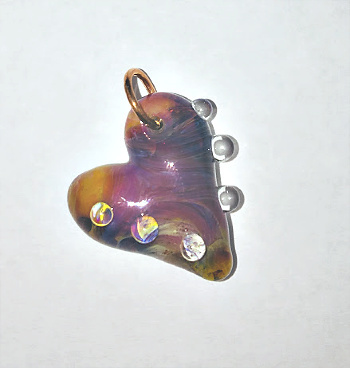 Handmade one of a kind glass heart pendant complete with jump ring and ready to hang. 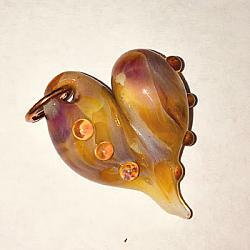 Will make a beautiful necklace or charm. 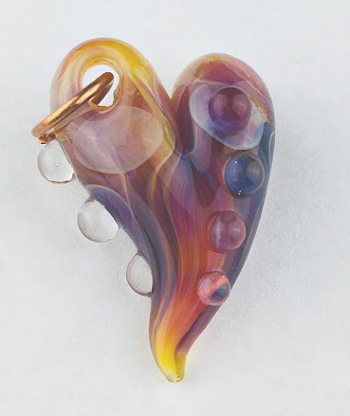 Heart pendant spun from beautiful Amber Purple borosilicate glass over white boro glass, crystal clear drops to magnify the colors and give the pendant a wet raindrop look, with jump ring for hanging on a chain or silken cord. 34 x 24 mm at the longest and widest points. 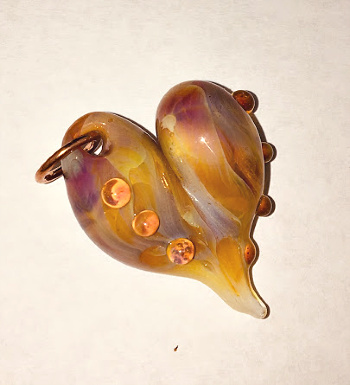 Deep purple swirled with golden amber and drops of crystal for sparkling sunlight effects, spun from borosilicate glass by hand. Each heart one of a kind. Beautiful medium sized heart pendant with jump ring for stringing on a chain or silken cord. 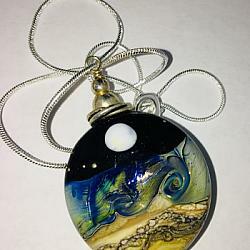 Wonderful full moon over the ocean pendant. Black and ivory base bead with silvered ivory accents and silvered glass highlights. Star sparkles of 99.9% pure silver. 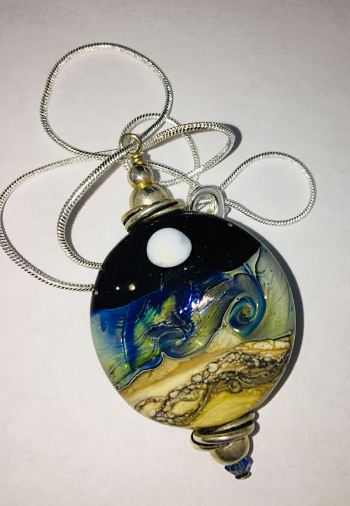 Pendant is wrapped with sterling silver with sterling silver bead accents and silver plated wire spacers.